Combine butter, applesauce, brown sugar, vanilla, salt, and egg in a bowl and whisk until smooth. Add flour, HERBALIFE Formula 1 shake mix, and oats and stir until ingredients are moistened and well combined. Fold in chocolate chips and dried cherries or cranberries. Divide dough into 6 servings, about 1/3 cup each. Put one serving in a microwave safe bowl or ramekin and microwave on high power until cookies are just baked around the edges but still soft in the center, 45 seconds to 1 minute. Let cool for 30 seconds and enjoy! Microwave each serving one at time, or freeze the remaining servings in Ziploc bags in the freezer. Amazing and no flavor or texture was lost, pretty awesome considering I cut almost 50% of the fat out of the recipe. 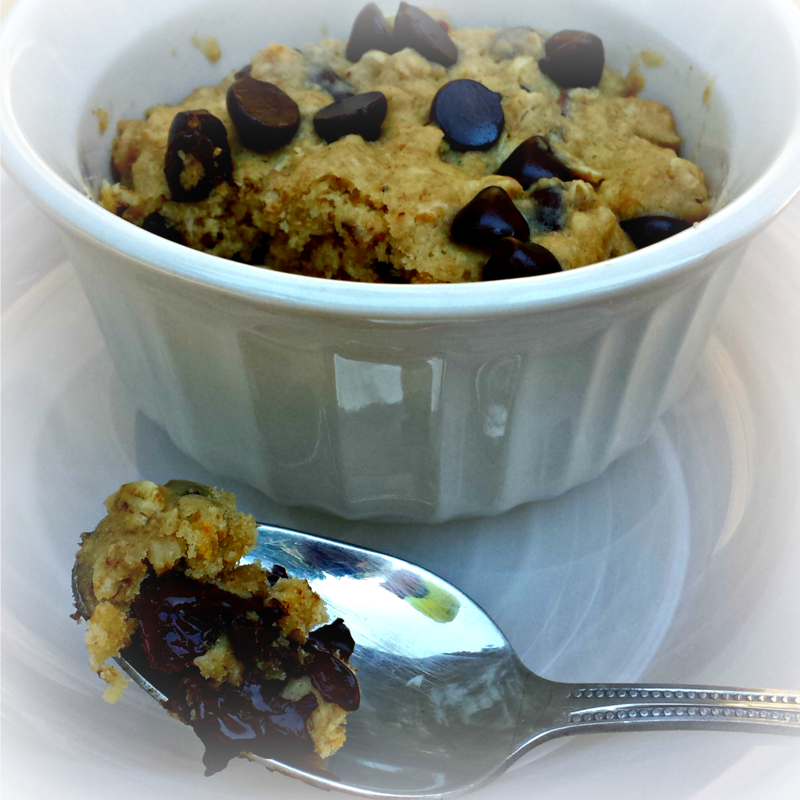 A warm, moist chocolate chip cookie with melted chocolate chips! A few nights a week I crave something sweet and this hits the spot…. and, you can eat just one! Thanks Deborah! I am writing that the Meatless Monday for future reference too! I’m definitely trying this tonight!! Do you mind if I share on my blog and with my Herbalife clients?! Thanks!! Everything looks so good ! thank you for all your creativity with Formula 1 powders. I can’t wait to try the chocolate chip cookie . I don’t have Splenda and have never actually tried it, I’ll have to change up that ingredient with something else. And by the way thank you for your service in the army.